Another ferry tragedy in the making? The 259 gt ro-ro ferry Rabaul Queen sank off the Northwest coast of Papua New Guinea near Finschhafen. 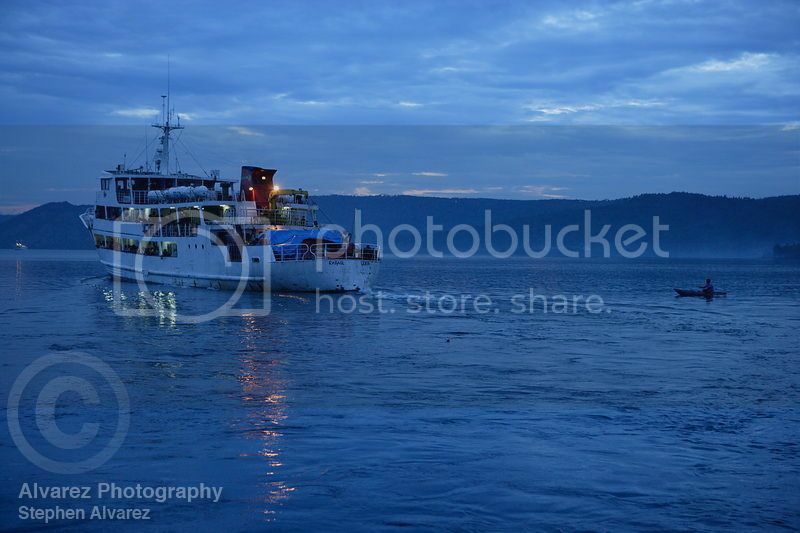 The Rabaul Queen was traveling between the ports of Kimbe and Lae with around 300 passengers when it encountered bad weather. A distress call was sent out and four nearby merchant vessels responded. One vessel reported that it had pick up 28 survivors. Initial reports state 50 people total have been rescued with many pulled directly from the sea. Two helicopters were deployed from Lae to search for survivors. The Australian Maritime Safety Authority (AMSA) is assisting the Papua New Guinea (PNG) Maritime Rescue Coordination Centre in the rescue efforts. Some 240 people have been rescued from the Rabaul Queen. Conflicting reports state there were some 300 to 350 passengers and 12 crew on board the vessel when it sank. Many of the passengers were students and teachers. Rescue efforts continue to find people in life rafts, but conditions have limited the number of vessels involved in the search. The last report stated some eight vessels and multiple aircraft were still involved in the rescue effort. The Rabaul Queen sank rests roughly a kilometer under water leaving little evidence of its sinking. The cause of the sinking is still not known. Wasn't it at January 30th, the Wilhelm Gustloff was torpedoed and more than 10.000 people perished? Last edited by releck97; February 3rd, 2012, 02:34. 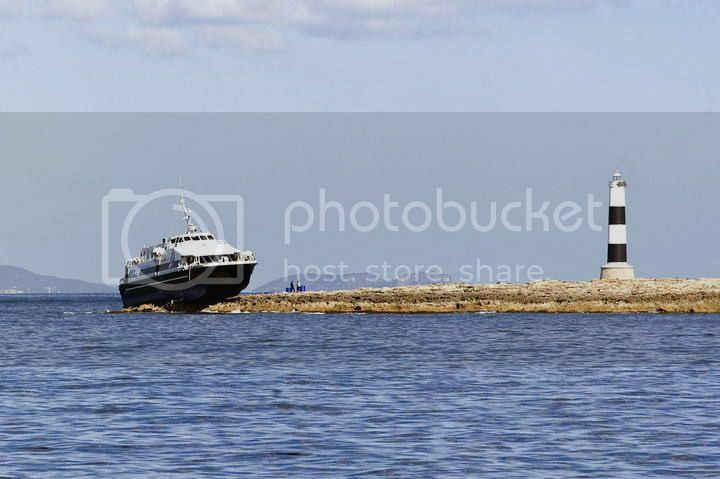 Anyone heard about a passenger ferry running aground outside of Rome today? That does not look good, let's hope that nature is kind to her and give her some calm conditions. When incidents like this happen, it just goes to show how important it is to properly maintain seals and closing mechanisms on things like vents and hatches near deck level. One single 3 inch goose neck vent that does not close properly could easily make all the difference to the ship surviving this. 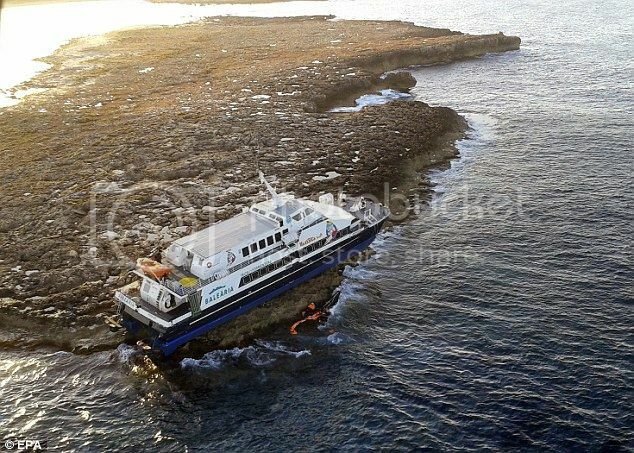 The 39 meter long, 44 dwt high-speed ferry Maverick Dos went aground in the Balearic Islands, Spain. 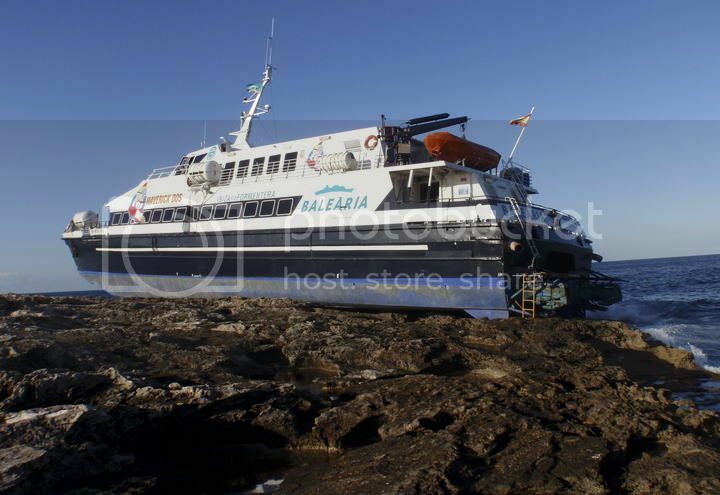 The ferry was operating on a route from Ibiza to Formentera with 21 passengers on board when it went hard aground. One passenger was slightly injured. The vessel contacted authorities and 21 passenger and 4 crew were safely evacuated and arrived at the port of La Savina. Reports state there was some fuel leaked from the Maverick Dos. The ferry can carry up to a total of 8,400 liters of diesel fuel in two tanks. Authorities are conducting an investigation into the incident. It is just as irrelevant as the comparison of the CC and Titanic (the movie??) The actual incidents happened 100 years apart and bear no resemblance, either in the equipment available, the place where it happened, or the how and why it happened. I just noticed that one Life Raft is gone at the bow. That is probably what the orange stuff below is all about. PS> No, there is no tide in the Baleares, so that is NOT the reason why he is so high and dry. Last edited by ombugge; February 19th, 2012, 12:27. Not quite an accident, but amusing, if not painful to watch. 10 out of 10 for perseverance, but i personally think he should of given up much sooner than he did, or not have even attempted it in the first place. Have they finally invented an indestructible ship? If the tide did not put her up there, how the hell did she get there? The hull looks totally intact! She is one tough puppy if she drove herself up there without destroying herself in the process. Today Thursday, 23th of February of 2012, the sun rose in Formentera at 7:35 h and sunset will be at 18:40 h. The moon rose in the east (90º) at 7:57 h and will set in the west (274º) at 20:29 h.
In the high tide and low tide chart, we can see that the first low tide was at 1:19 h and the next low tide will be at 13:34 h. The first high tide was at 8:15 h and the next high tide will be at 20:33 h.
The tidal coefficient today is 89, a high value and therefore the range of tides and currents will also be high. The tide heights today are -0.1 m, 0.1 m, -0.1 m and 0.1 m. We can compare these levels with the maximum high tide recorded in the tide tables for Formentera which is of 0.1 m and a minimum height of -0.1 m.
The lunar phase is a Waxing Crescent. Today we have 11 hours and 5 minutes of sun. The solar transit is at 13:08 h and the length of time the moon will be visible will be 12 hours and 32 minutes. 0.2 m. rise and fall does not do this. For you HSC experts on CVF; Is this a Fjellstrand boat??? I certainly was not doubting the issue of no tide, i was just so amazed she got herself there without ripping herself to bits. Obviously there will be damage that does not show in the photo, but she looks like she's just taken a stroll on a nice sandy beach, not just rammed herself across some very unforgiving rocks. I am very impressed not to see much much more damage evident in the photo. No I did not think you did. Just put the tide tables for any "doubters" out there. I totally agree with you, the visible damages looks almost superficial. Amazing. She is a Fjellstrand "original", not a knock-off.